Just a few years ago I was working as a Hebrew teacher for kindergarten at a Jewish day school. 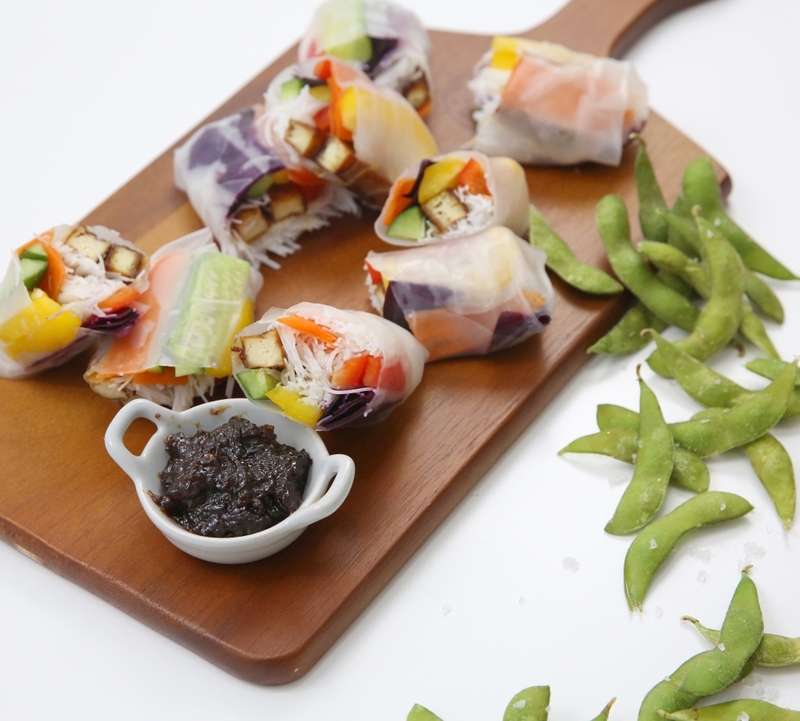 I remember once telling my co-worker about these really cool summer veggie rolls that I had seen and wished I could make—at the time I was under the impression that there was no such thing as kosher rice wrappers. I was living in Washington Heights in NYC and for all its Jewish residents there really wasn’t a big selection of kosher specialty items in the local supermarkets. Actually, there really weren’t any specialty items at all. You could always find kosher chicken, some basic cheeses and a very small selection of meat, but anything ethnic, fancy or otherwise interesting? Completely out of the question. 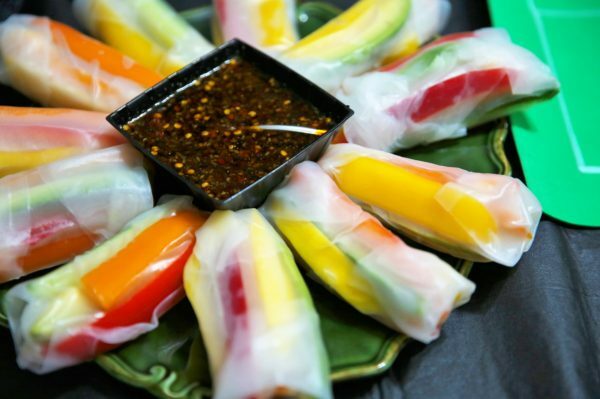 Anyway, back to my co-teacher—when I told her about these summer rolls she looked at me, stunned, and said, of course you can make summer rolls—the Kosher Marketplace sells them! As it turns out, lots of kosher specialty stores did as well! That was news to me, as I didn’t do much grocery shopping on the Upper West Side, because who wants to get on a packed subway at rush hour with bags of groceries?! But after work that day, I took the crosstown bus and made a pit stop at The Kosher Marketplace, and lo and behold, I discovered kosher rice wrappers (and lots of other stuff, but that’s a story for another day)! After that revelation, my life basically changed. 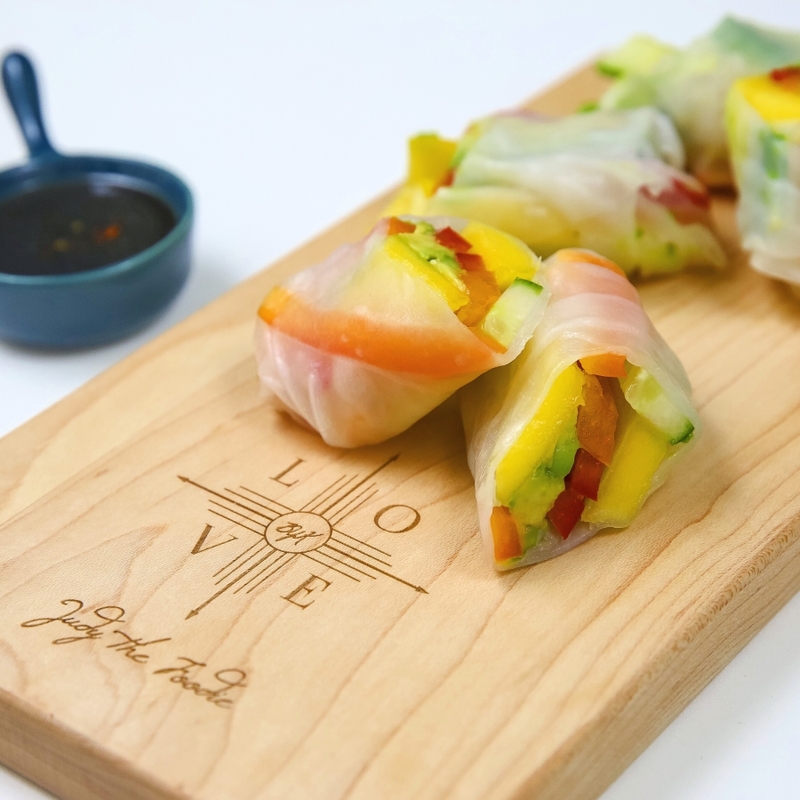 At first, I wasn’t crazy about the discovery because I had trouble closing the rice wrappers, or I filled them too much, or they always somehow managed to rip, but as I got better and better at rolling summer rolls they became one of my favorites. And once I developed my classic dipping sauce, this appetizer earned a permanent seat at almost every one of my Shabbat meals. These rolls are such a staple for me that when I once interviewed for a food gig I brought them along as a sampler and was literally hired on the spot. Some of my favorite dishes are ones that I feel like I have perfected but can also constantly change according to what I am in the mood for. 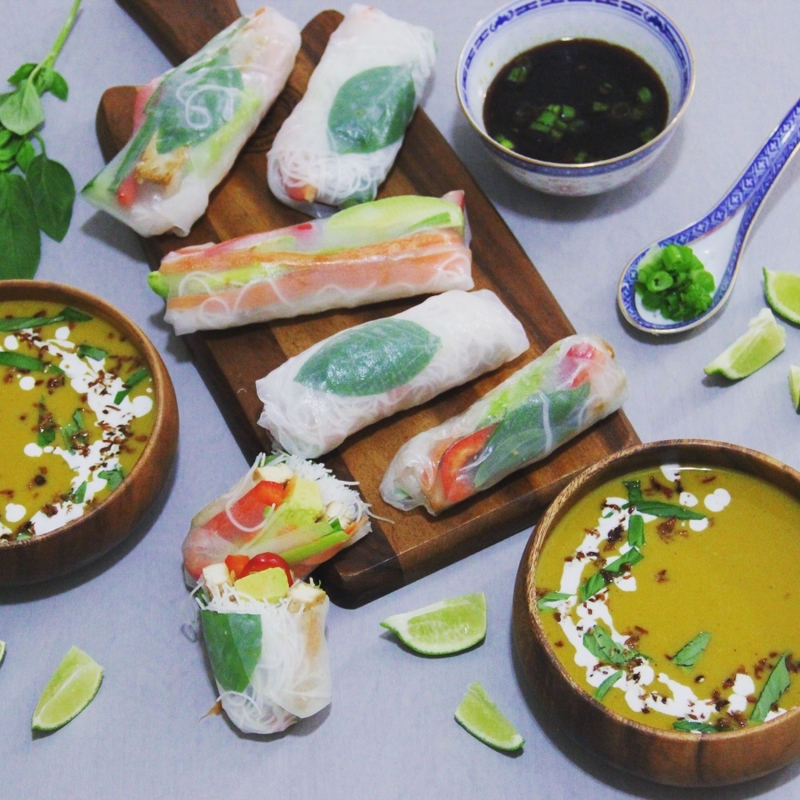 My miso soup, thin crust pizza dough and of course my summer rolls all fit the bill. They are so versatile in how they can be served. I serve them plenty of times as a Shabbat lunch appetizer, with nothing but veggies and sliced fruit, like mango, for the filling. I have also made them into full dinners by adding marinated tofu or salmon and rice noodles, encompassing all three major food groups! And they’re great party food when you want something light but delicious added to the menu! 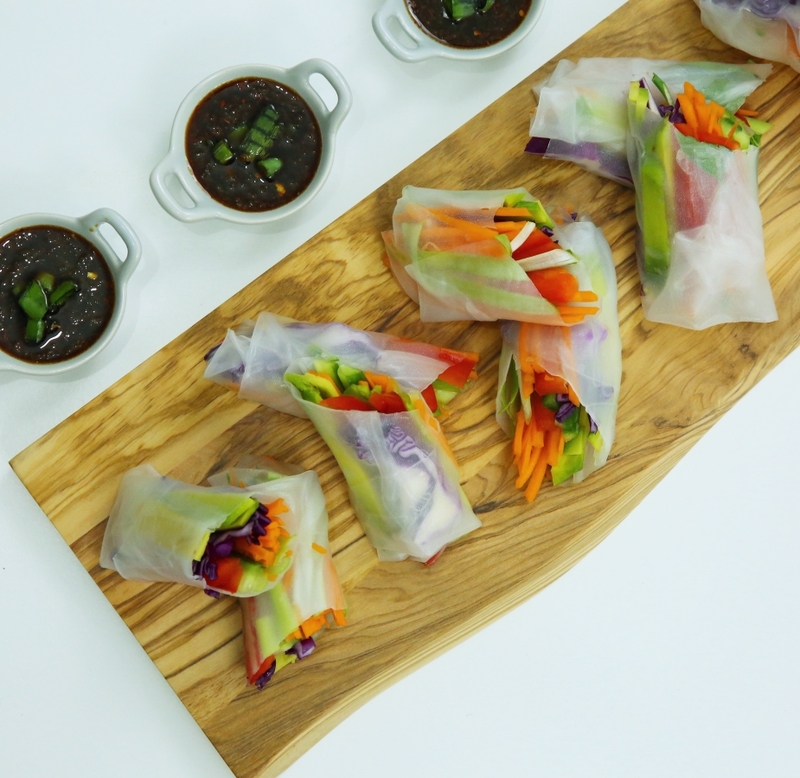 I put together this video on how best to cut your veggies for the spring rolls and how to roll them, because I know that learning to roll them properly was the main thing that prevented me from making this super easy and healthy dish early on. 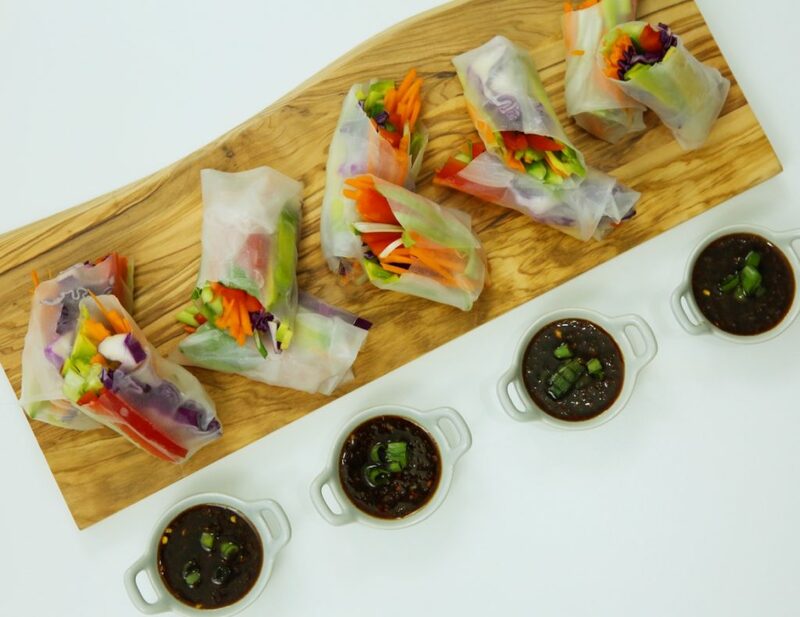 So watch the video, become a pro, and then go make your own summer rolls! This is just a starter recipe that you should build off. 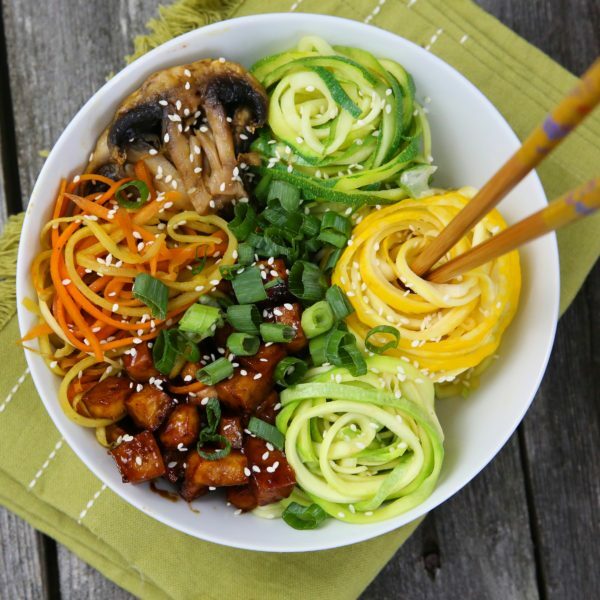 Customize your wraps with the vegetables you like, add some fruit, a protein like tofu or fish and possibly some rice noodles. Set up your station: parchment lined baking sheet for finished rolls, large round plate to roll on, all your fillings and a round cake pan/large frying pan. Fill the round dish halfway with warm water (should be able to put your fingers in easily without burning). For each wrapper, immerse it in the hot water bath until it softens, which takes about 30 seconds. Watch for it to begin curling, then immediately flip it over. Use both hands to pull it up out of the water once soft, being careful so it doesn't collapse on itself, and spread it immediately on a plate. Fill the lower center of the softened wrapper with the cut up vegetables/protein of your choice. To roll up your wrap, first fold the two sides in and starting from the bottom roll until it's closed and tight. Place each roll as you finish it on a cookie sheet lined with parchment paper and cover with a damp towel. Continue to do the above steps until you have run out of vegetables or wrappers. You may need to change out your water if it gets too cold. To serve, slice in half with a sharp knife place on a bed of alfalfa sprouts and serve with the dipping sauce. Whisk first 6 of the sauce ingredients together until mixed well. Drain the tofu and place the block of tofu on several layers of paper towels. Cover tofu with several more layers of paper towels. Top with a heavy pan. Let stand 30 minutes to remove the moisture. Meanwhile whisk together your marinade. Cut tofu into 1/2 inch cubes if for a salad or stir fry or into 1/2 inch matchsticks for sushi. Place in marinade, mixing gently to coat all the tofu. Let it marinate for 1/2 hour but if you don't have time you can leave in for 10 minutes. Preheat the oven to 400 F. Remove the tofu from the marinade (reserving the marinade) and place the tofu onto a parchment lined baking sheet. Pour the marinade into a small saucepan, add in 2 tsp cornstarch and boil until it thickens. Bake the tofu for 30 minutes, flipping them halfway through and brushing with the marinade right before the flip and on the other side after the flip. Brush with remaining marinade right before removing from oven and let bake for 5 more minutes.